A lot of times, seniors with memory loss can recall the name of every friend they had 30 years ago, but they can’t remember what they ate for breakfast. Checking your parents’ short-term memory is easy: ask them questions about their day. If they have a hard time with their responses, that might be a red flag. If your mom has a puzzled look on her face every time you explain why you had a rough day at work or try to catch her up on your favorite TV show, you might want to look into other symptoms of memory loss. Why? 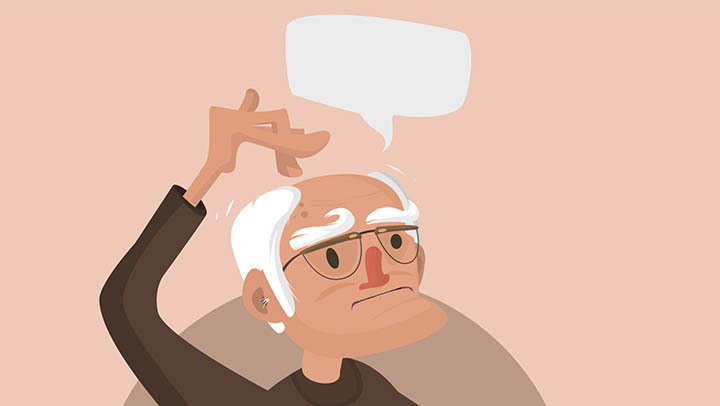 Because memory loss impairs our abilities to recognize words, both visually and audibly. So, if your mom can’t follow your stories, it may be because she doesn’t recognize some of the words you’re using. Did your dad always have an impeccable sense of direction that guided your family through every summer vacation, but now he needs to pull out a map? Chances are, that’s a normal part of aging. But what if your dad gets lost on his way to the same grocery store he’s gone to for 15 years? Or takes the wrong turn on his routine morning walk around the block? If your mom or dad has multiple episodes of being disoriented in familiar places, that may be a sign of more significant memory loss. We all have days where we put less effort into our appearance (messy hair and sweat pants, anyone?) But, if your mom goes days without brushing her teeth or changing her clothes, or if she appears to be avoiding bathing altogether, that might be a cause for concern. Make sure the bathroom is warm, inviting, and well-lit, especially in evening hours. Lay out everything required to take a bath or shower (i.e. soap, towels, etc.) in clear sight. 5. Losing things… a lot. Have you ever been in a panic over misplacing something important and thought to yourself “where is the last place I had it?” People with memory loss have a really hard time answering that question, so a lot of their stuff, important, mundane, or anywhere in between, gets lost and stays lost. Also, people with memory loss sometimes stash things away in “safe” places and forget where they are, compounding the lost-and-can’t-be-found conundrum. According to the Alzheimer’s Society, if you’ve noticed an increase in your mom or dad losing things, you should make sure not to leave important documents laying around, and have a back up of other essentials like keys or glasses. If you notice one or more of these symptoms in an aging loved one, it may be time for senior living or Memory Care. To learn more about what to look for, contact your closest Milestone Retirement community today.